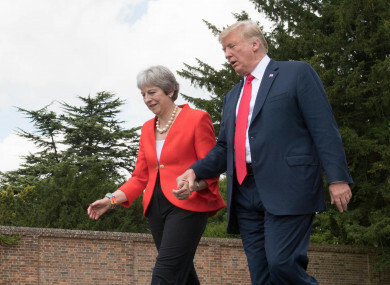 THE SON OF US President Donald Trump has said that UK Prime Minister “ignored advice” from his father and was now leaving the British people in limbo over Brexit. Writing a piece in this morning’s Daily Telegraph, Donald Trump Jr said that Theresa May needs to “honour that promise” to British people that the nation would leave the EU on 29 March. Trump Jr’s comments come with less than 10 days now until the official date the UK is due to leave the EU. However, after House of Commons Speaker John Bercow ruled out holding a third meaningful vote on May’s much-maligned Brexit withdrawal agreement, the prime minister is set to formally request that Brexit be postponed. As well as claiming May had ignored the advice of President Trump, Trump Jr said May is ignoring the will of the British people too. Trump Jr said this situation is important to note for Americans because Brexit is an example of how “established elites will try to subvert the will of the people” when given the opportunity. He added that the people of the UK and US must reaffirm their decisions in previous elections and “stand up for themselves against the global elite”. The end of the article lists Trump Jr as executive vice president of the Trump Organization. Email “Donald Trump Jr writes in British paper that Theresa May 'ignored advice from my father' on Brexit”. Feedback on “Donald Trump Jr writes in British paper that Theresa May 'ignored advice from my father' on Brexit”.